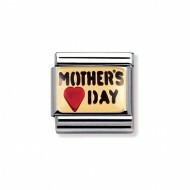 Composable Nomination Classic Gold & Enamel Messages Mothers Day Black and Red Enamel 18ct Gold . 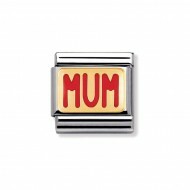 Composable Nomination Classic Gold & Enamel Messages Mum Red Enamel 18ct Gold. Composable Nomination Classic Gold and Cubic Zirconia Nature Lilac and Orange Flower Charm, a stainless steel base link with 18ct Gold and Cubic Zirconia. 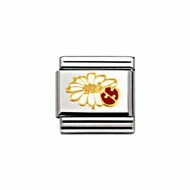 Composable Nomination Classic Gold and Cubic Zirconia Nature White Flower Charm, a stainless steel base link with 18ct Gold and Cubic Zirconia. 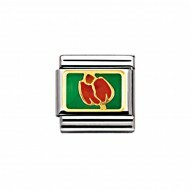 Composable Nomination Classic Gold and Enamel Nature Butterfly Charm, a stainless steel base link with 18ct Gold and Enamel. Composable Nomination Classic Gold and Enamel Nature Cherry Blossom Charm, a stainless steel base link with 18ct Gold and Enamel. 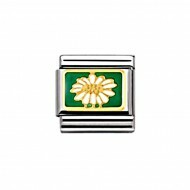 Composable Nomination Classic Gold and Enamel Nature Daisy Charm, a stainless steel base link with 18ct Gold and Enamel. Composable Nomination Classic Gold and Enamel Nature Forget Me Not Charm, a stainless steel base link with 18ct Gold and Enamel. Composable Nomination Classic Gold and Enamel Nature Hibiscus Flower Charm, a stainless steel base link with 18ct Gold and Enamel. Composable Nomination Classic Gold and Enamel Nature Ladybird with Flower Charm, a stainless steel base link with 18ct Gold and Enamel. Composable Nomination Classic Gold and Enamel Nature Mimosa Charm, a stainless steel base link with 18ct Gold and Enamel. Composable Nomination Classic Gold and Enamel Nature Orchid Charm, a stainless steel base link with 18ct Gold and Enamel. Composable Nomination Classic Gold and Enamel Nature Pink Rose Charm, a stainless steel base link with 18ct Gold and Enamel. Composable Nomination Classic Gold and Enamel Nature Poppy Charm, a stainless steel base link with 18ct Gold and Enamel. Composable Nomination Classic Gold and Enamel Nature Primroses Charm, a stainless steel base link with 18ct Gold and Enamel. 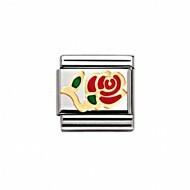 Composable Nomination Classic Gold and Enamel Nature Red Rose Charm, a stainless steel base link with 18ct Gold and Enamel. 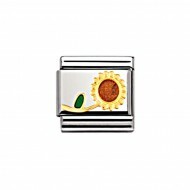 Composable Nomination Classic Gold and Enamel Nature Sunflower Charm, a stainless steel base link with 18ct Gold and Enamel. 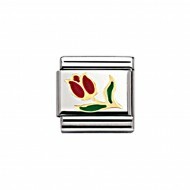 Composable Nomination Classic Gold and Enamel Nature Tulip Charm, a stainless steel base link with 18ct Gold and Enamel. 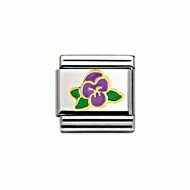 Composable Nomination Classic Gold and Enamel Nature Violet Charm, a stainless steel base link with 18ct Gold and Enamel. 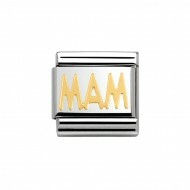 Composable Nomination Classic Gold Writings Wales Welsh Mam Charm, a stainless steel base link with 18ct Gold. Composable Nomination Classic Gold Writings Wales Welsh Mum Charm, a stainless steel base link with 18ct Gold.